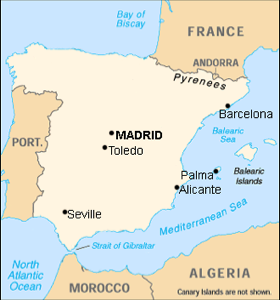 Herping for reptiles and amphibians including lizards, snakes, frogs, toads, turtles, newts, salamanders and other interesting creatures in their natural habitat in Spain, with map locations, sharp pictures and relevant commentary. Herping in Spain proved to be far more productive than my brief time in France, although that may have more to do with the notion that I was able to dedicate an entire day to herping while in Spain. 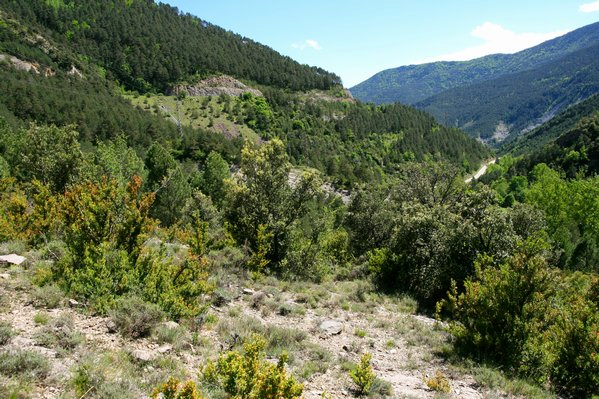 After doing a little research on Spanish reptiles and amphibians, I decided to drive from Barcelona where I was staying, to a spot in the Pyrenees Mountains, which form the picturesque border between Spain and France. 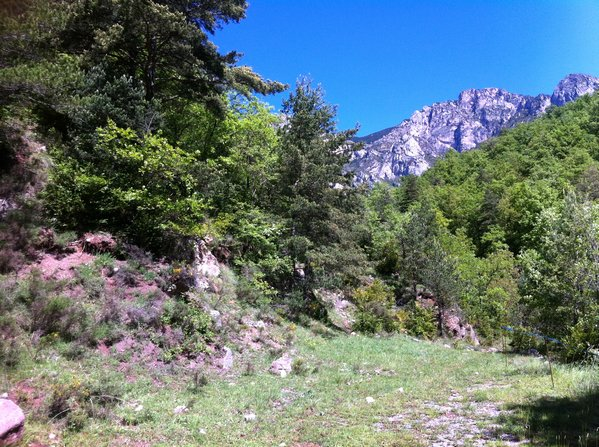 Below I'll detail my experiences herping in Spain—specifically, within the beautiful Spanish Pyrenees mountains, at an approximate altitude of 2,690 feet (820 meters). 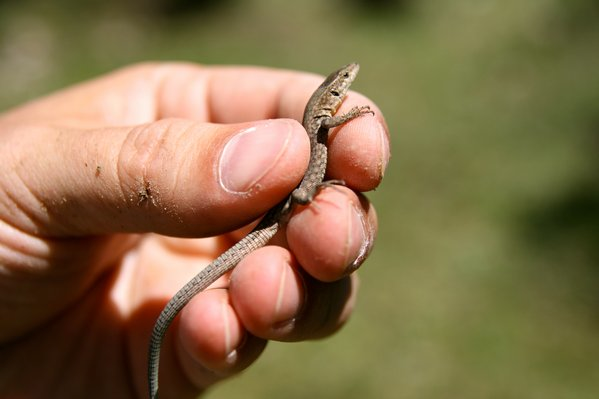 All photographs are in situ, with the obvious exception being the close-up picture of my holding a lizard. After driving about 90 minutes Northeast on a clear and sunny morning, I finally reached the majestic Pyrenees mountains. These border mountains contain many different species of both reptiles and amphibians, so I was anxious to start herping. The first thing I noticed was that the mountains were steep, and there weren't many open or even moderately flat areas to herp. In fact, I became slightly concerned about the altitude (around 2,600 feet), strong winds, and lack of suitable walking areas. But, if there's one thing I've learned, it's that persistence pays off. I noticed a nondescript dirt road right off the main highway, so I took it. It was the right move. The road was filled with deep potholes and led down to a little valley, which fed right into the Parc Natural del Cadi-Moixero, which is exactly the park I was hoping to find (not having GPS made it a little more challenging). One fringe benefit of herping in the Pyrenees was that they were considerably more majestic than I'd anticipated. Plus, being nestled in a valley meant protection from the wind, coupled with a warm sun, meant conditions were dialed-in for herping. It took about one minute for me to spot my first lizard of the day, a Large Pasammodromus (Psammodromus algirus), pictured below. It was curious, and would actively (and fearlessly) climb around the rocks looking at me. 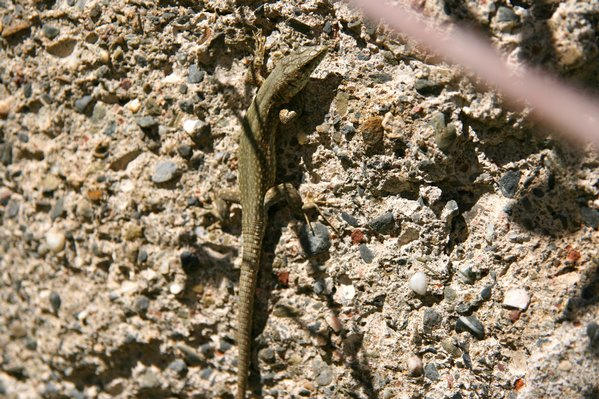 It was one of the first times I've ever witnessed a lizard coming towards me to check me out. I saw several of these lizards throughout the day. 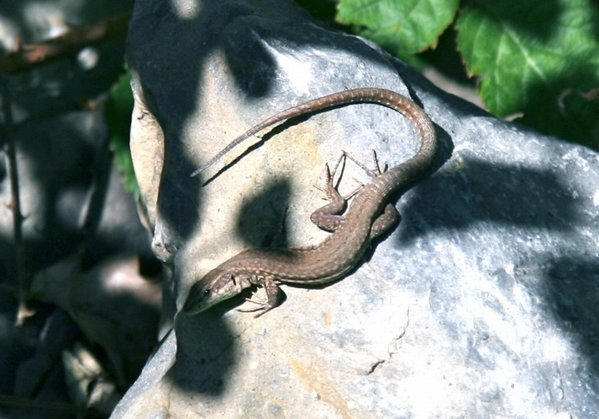 As I was herping, I would see lizards basking in rocky outcrops, in the grass and bushes, and once in a while one would run right in front of me. Here's a beautiful Common Wall lizard (Podarcis muralis), the lizard I most frequently observed. There were some lizards that moved so quickly it was hard to identify them before they reached cover. After reviewing the pictures I did take, it was not easy to pinpoint each species with certainty. So, I decided to contact the Spain Herpetological Society, as well as a few experienced European herpers. Finally, after several days and plenty of back-and-forth, the below lizard was identified as a Catalonian Wall lizard (Podarcis liolepis). Catalonian Wall lizard (Podarcis liolepis) in the Spanish Pyrenees mountains. 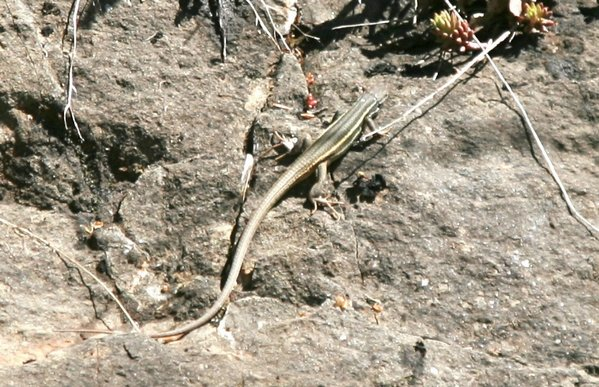 Here's another lizard that seemed to result in several species guesses, but ended up being another Catalonian Wall lizard. If I had to guess, I'd say I saw between 50 and 75 lizards while herping for a few hours on this perfect day. In fact, lizards weren't the only thing I saw while trekking up and down the hills. While I was walking along a path to head up another hillside, I looked down and to my left and saw a small, light-colored snake basking on a flat stone. I tried to get my camera out quickly, but after about five seconds, it began scurrying off. If I had been familiar with Spanish snakes, I would have jumped over and grabbed it. 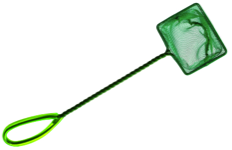 But, since there were adders around, I decided to play it safe. 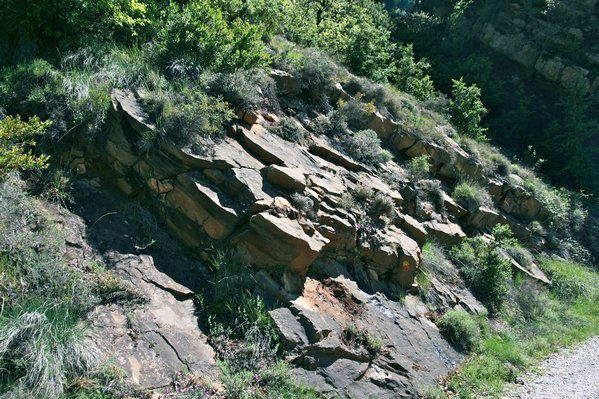 This rocky hill was home to several species of lizard, each scurrying across its warm surface. 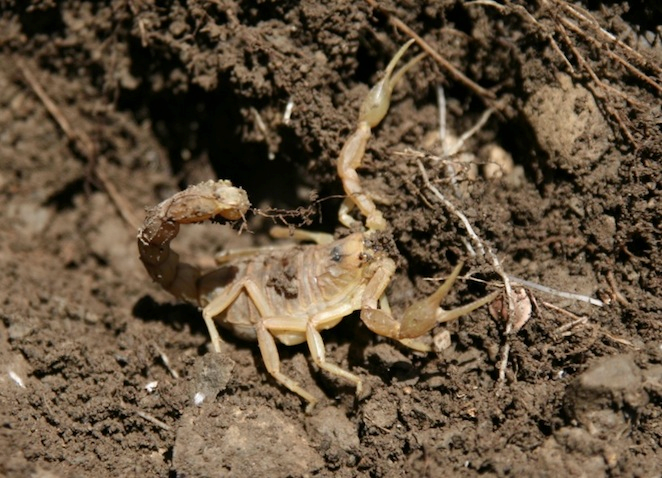 Here's a Mediterranean scorpion (Buthus occitanus) I found under a hillside rock. 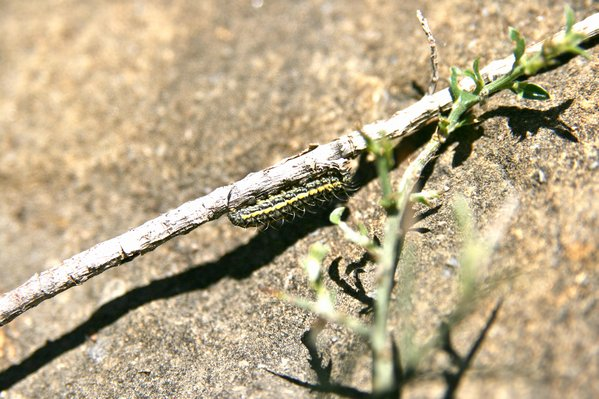 I learned later that this is a Pine Caterpillar (Thaumetopoea pityocampa), a nasty insect with poisonous hairs that can cause humans to go into shock. There weren't any still or slow-moving bodies of water around, so I wasn't able to locate any amphibians, despite really wanting to find a Pyrenean Brook newt. 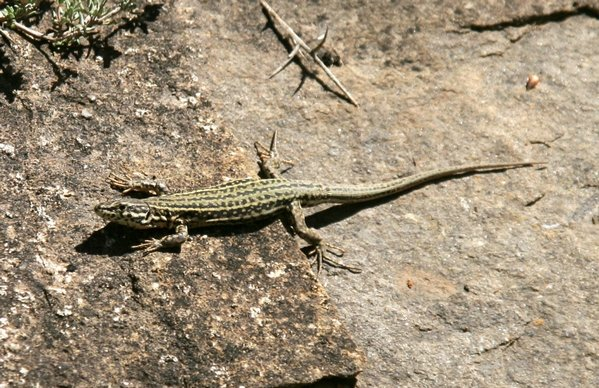 Here's yet another Catalonian Wall lizard (Podarcis liolepis). This lizard let me get very, very close. 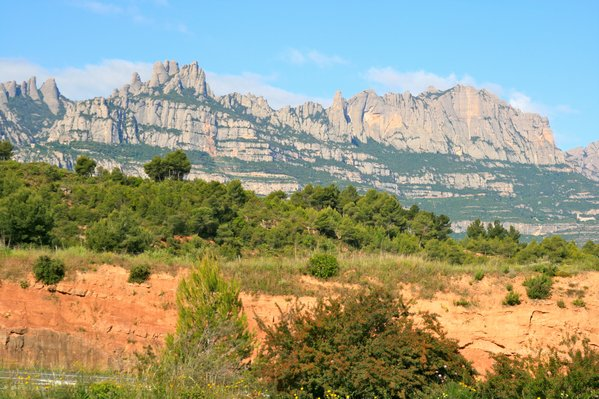 Here are the Monserrat mountains, somewhat near where I was herping in the Spanish Pyrenees. I was told by a Spanish herpetologist that these mountains are well known as a possible final resting place of the Holy Grail. More herping scenery from the Pyrenees in Spain. It was a blast to herp here. 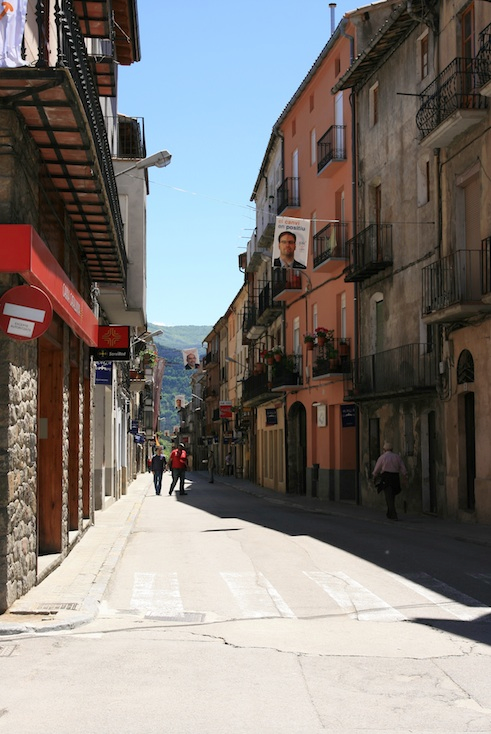 Here's the little Spanish town where I ate lunch. No one spoke a word of English, and it was sort of fun to communicate using my remedial Spanish-speaking skills. Herping in Spain was an absolute pleasure. The landscape was beautiful in and of itself, but the fact that I was able to herp in the Pyrenees was icing on the cake. 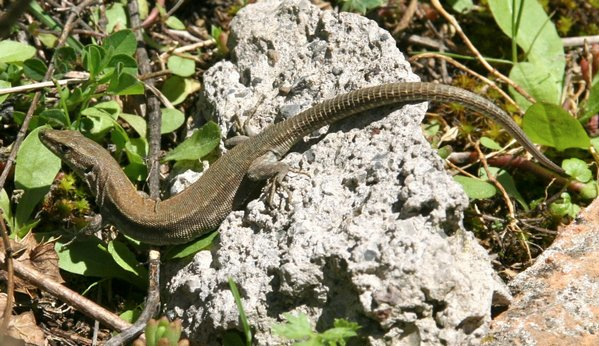 Plenty and lizards, and even a snake, meant it was a successful and memorable day of finding reptiles in Spain.